PPD – Car loans – 3 years or 9 years? Upon graduation, doctors will need to drive a car. It should be reliable enough so that it won’t be breaking down every time you have a medical emergency at the hospital. So should you take the maximum 9-year loan or the shortest 3-year loan? For a decent local car, we expect the car loan to be around RM64k. 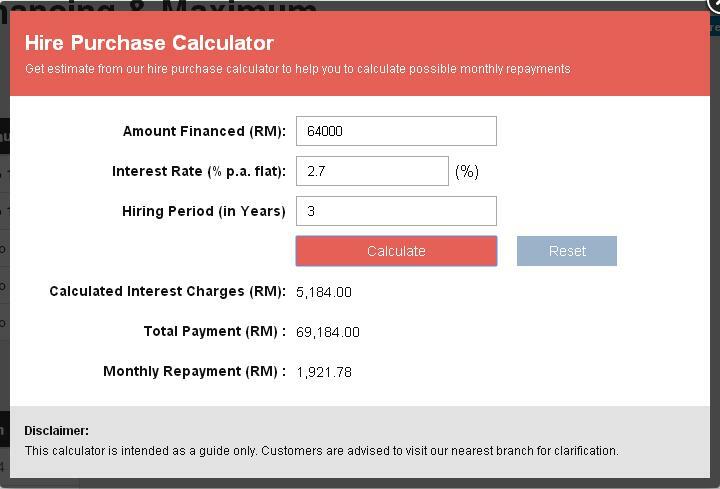 At current rates (2.7% for 3 years and 2.6% for 9 years), a three-year loan would have you coughing out MYR1922 per month (about two thirds of your monthly pay) and paying a total of MYR5814 in interest. A 9-year loan would have you paying MYR732 every month (about a quarter of your monthly pay, therefore less painful) and paying a total of MYR14,976 in interest, about 3 times more compared to the 3-year loan, which is expected since 9 years is 3 times longer than 3 years. Some would argue that the money saved (MYR1922-MYR732=MYR1190) by taking a longer loan could be invested and that would earn more returns compared to the extra interest paid (MYR14,976-MYR5,814 = MYR9,162). So let us see if this myth is true? But remember that those in the 3-year loan group can invest the full amount of MYR1922 upon the settlement of their loan. The average dividend rate of Amanah Saham Bumiputera for the last 10 years is 7.5%, which we will use in this calculation. 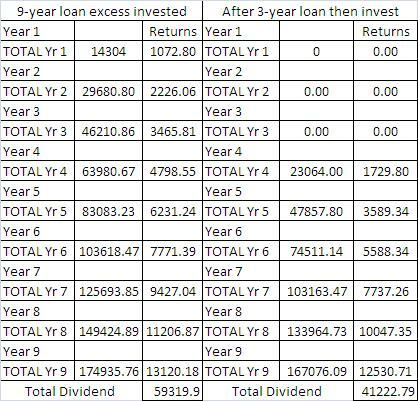 Those who opted for the longer loan ended up with a larger cumulative dividend after 9 years. You can download the spreadsheet from here. So if you are disciplined enough, you can opt for the longer 9-year loan but you must reinvest the excess amount from the lower monthly installment into your unit trust. Don’t spend it elsewhere. I am a weak man, easily tempted into buying things whenever I have excess cash in hand, so I opted for the shorter 3-year loan. Disagree? Kindly write-in your feedback in the comments section. This entry was posted in PPD. Bookmark the permalink. 1 Response to PPD – Car loans – 3 years or 9 years? Smart way to reinvest and compensate for the longer duration of payment.